You're looking at a piece of original art by comic book legend ALEX TOTH, for a model sheet from Hanna-Barbera's SPACE GHOST cartoon. 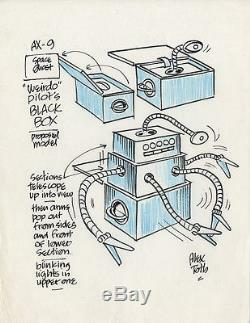 This is a great piece, featuring designs for'WEIRDO PILOT'S BLACK BOX', all in Toth's classic, graphic style. Pen and ink on paper (8 1/2 x 11 inches), excellent condition. All kinds of great artists here. The item "ALEX TOTH Space Ghost ORIGINAL MODEL SHEET ART Hanna-Barbera" is in sale since Saturday, December 10, 2016.